Shim Sham for Frankie Manning on May 26! 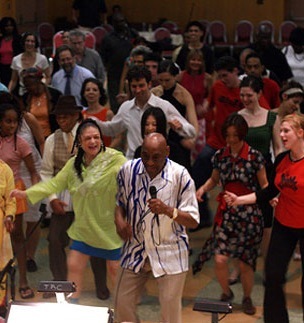 A call for all swing dance communities worldwide to host a swing dance on Thursday, May 26th, offering a free Shim Sham class (see video link at bottom) in honor of the Father of Lindy Hop, Frankie Manning, who was born on May 26, 1914…. Several communities are already participating, so let's join in! Take this opportunity to help us grow the dance community together on this special occasion. If your community can afford to make the event FREE admission, that will draw in more people, obviously. We will leave that up to you. Again, this is a collective effort of the worldwide swing community to grow the dance scene globally, teach new dancers the Shim Sham, and honor Frankie! I know that the 9:20 Special in San Francisco has something very special planned, the Frim Fram Jam in New York City also will feature a special Shim Sham, and many more scenes around the world I'm sure will participate. Montreal will be organizing a free lesson before our Flash Mob tomorrow night! shim shamming. 4times was enough for me.